I have recently begun to enjoy making muffins and I make a batch of some kind of muffin almost regularly. There's something very magical about the whole muffin-making process. 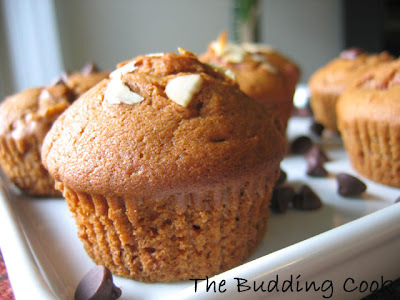 It is amazing to see that just by addition/substitution of fruits, nuts, and/or chocolate chips, the basic muffin can be transformed into a delicious treat. I just love the smell that wafts through the entire house when the muffins are baking and I am pretty sure that this is what heaven would smell like. Preheat the oven to 375 degrees F. Line a 12-cup muffin pan with paper liners. In a large bowl, mix together the dry ingredients. In a separate bowl, mix together the wet ingredients. Fold in the strawberries, chocolate chips and almonds. Spoon the batter and place in each paper-lined muffin cup till it is two-thirds full. Bake for 25 minutes or so till the tops are nice and brown or until a toothpick inserted in the middle of the muffin comes out clean. This recipe yields 12 muffins. Those muffins look tempting, feeling like grabing them..
Beautiful muffin.. feel like having one. I wish I could pick one up and bite in right now. And the combination stawberry and chocolate HAVEN. I do agree it is great to make muffins. Mmmm! Chocolate and strawberry:) How can you go wrong! u are right.. its interesting to see the variations possible in the muffins and the smell when its feshly baked..awesome! Loved to look at your muffins with all those strawberry chunks. I was kind of busy and was not blog hopping. I loved your tomatoey raita. The texture and color of it is so gorgeous. Nice cute cakes TBC! I always bake in a large dish! after seeing so many cupcakes I too am temted to make tham! wow! never seen this unique combi before - strawberry with choc.. and the muffin inside pic looks awesome! The last picture says it all! YUMMY! Archana, do give ita shot...it's pretty easy to make.I have made eggless muffins before.You could probably add a banana or some applesauce instead. Suma,thanks:-)Good to have you back. Oooooh! Beautiful strawberry and chocolate muffins! Ooo, gorgeous muffins and I like the new layout!! Strawberry and Chocolate go together well usually don't they? Your muffins look very nice TBC. Hmmm....I just added a comment saying that I like your new layout but I just realised that it's not new! There's actually another Budding Cook as well and I got you confused ;-) sorry! wow! !..yummy muffins, this and the previous ones you had come up with...i think its high time that you change your name from a budding cook to a "full-bloom"!! !..coz, u know what, last month, i got myself too much interested in cooking and stuff, to be precise, after meeting Viji of Vcuisine, purchased a pack of ready -to-make muffin mix, and paper cups ..(but not the muffin moulds!!!! )..read the instructions carefully, which said to preheat the oven to 425 degs...and found myself staring at the oven, and wondering "oh, my..this oven heatd up only till 250 deg's!, how do i make my muffins..! !..anyway, went along to make it in the shape of a cookie, but got baked to the toughness of a hard burned biscut!! !..later did i realize, again from Viji(thanks to her! ).that the temp shown on the pack is fahrenheit, and not degree celcius!! !....i am sooo illiterate, isnt it? ?/..have got a looong way to goo!!!! AKSAAWRH...lol:-).. u r so funny. First, welcome to my blog & thanks for leaving a comment. Thank you so much for all the nice things u have said about my blog. It feels really good. Asha, hope you are getting a little better every day. Please take rest & take care. Hugs to u. Thanks so much for visiting us! You have a GREAT blog here- v have added u to our blogroll. Thank you for adding me to your blogroll. These look absolutely divine! I added you to my blogroll too :) Hope you don't mind! i loved this too.. looks great.. 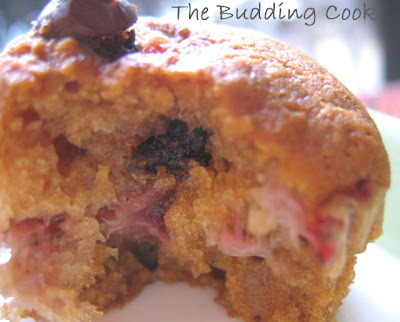 This recipe was amazing, I tried to make the muffins and they turned out perfectly. However, I actually had to add 1 c. more flour because my batter was too runny,but in the end they were high and perfect. Just made these. They are soo good! I decided to skip the orange extract and used 2 tsp of vanilla and the taste is awesome. thank you for sharing this recipe! Marlin- So glad the recipe worked for you- thanks for letting me know! The vanilla sounds like a great addition- I should try that the next time I make these.